Posted on February 29, 2016 at 5:31 am. 32Red Casino has unveiled a refreshing facelift, giving some new life back to one of our favourite real money venues. With a browser based site that’s now super user-friendly, new players and regulars alike can bask in the changes that make locating your favourite casino game easier than ever. 32Red Casino is one of our long running favourites, but the old site had left quite a bit to be desired, so we’re thrilled to see that the operators have created an updated site worthy of the casinos outstanding reputation. While the option still exists for players to download the premium 32Red Casino software, those who prefer the instant-play nature of browser based games can enjoy faster loading speeds and a site that’s much easier to navigate around. If you’re new to 32Red there’s never been a better time to join, and with great welcome bonuses available you can kick start your real money experience with less damage to your pocket. All new players who sign up for an account with 32Red receive $10 for free, no deposit required, so you can get a proper feel for what playing for real wagers is like. Move on to make a deposit, and you’ll be rewarded with an additional $32 for every $20 you deposit, awarding up to $160 in matched deposit bonuses all up. Dish of the Day – claim a different casino bonus every day – just sign in, wait for the Dish of the Day bonus notification to appear and opt-in if you like what you see. Ruby Red Rewards – earn loyalty points every time you play for real money, climbing up higher loyalty tiers as you go, with points redeemable for all kinds of casino bonuses. Ruby Tuesday – earn extra loyalty points every Tuesday playing selected pokies. Red Letter Day – every day players who make a deposit are selected at random to receive up to 250 free chips just as a little way of saying thank you. $250 Daily Freerolls – available in the downloadable casino only, joining in the Avalon Slots Tournament will earn the top 10 players a share of a $250 daily prize pool. 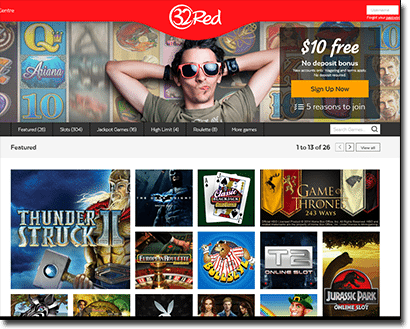 32Red is a Microgaming powered casino, with new games being added regularly. Recent releases include Bikini Party, Dragon Dance, Peek-a-Boo, Lucky Twins, Serenity and Star Dust. The new site makes playing at 32Red better than ever, so whether you’re a new player or an oldie who hasn’t stopped by in a while, head to 32Red.com today and enjoy playing at a premium real money casino that warmly accepts United States players.